Spring Anhydrous Ammonia | Soil Service, Inc.
It’s hard to believe we’ve already turned the calendar to the month of April, especially when one looks around and sees the small amount of field work that’s taken place up to this point across much of the corn belt. If I had to guess, I would say about 50% of the anhydrous ammonia (NH3) has been applied around central Illinois which lags where we typically are at this point. Applying NH3 in the spring can be a risky business to the health and establishment of a corn crop, especially when application is within 1 week of planting. The reason is NH3 acts as a strong desiccant to the young corn seedling by sucking water from seedling roots and tissue. The result is a burning of the root or plant tissue leading to uneven emergence and a stunted sick looking crop. Most injury occurs when soil conditions are less than ideal and when little to no rain (less then 1 inch) occurs after application. When NH3 is applied it starts to rapidly convert from ammonia (NH3) to a more stable safe ammonium (NH4) form of nitrogen. Ideally waiting 1 month or better gives the best odds of this conversion fully taking place and not causing injury to the crop but waiting that long is likely not an option this spring with some applications possibly occurring the day of planting. So, what can a grower do to prevent NH3 injury? Following these guidelines can help especially if your NH3 has yet to be applied. Focus on the spacing between the injection point and where the seed is placed. Leaving enough distance between the injection point of application and where the seed is placed will be key this spring. 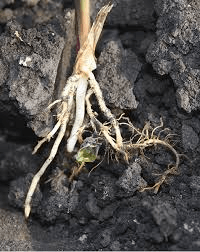 Free NH3 within the seed zone or when roots move into a zone of free NH3 can lead to plant injury. A good solution if the grower is equipped with GPS on his planter and applicator is to move the planter off the NH3 band by 4-6 inches. Doing this insures the seed is far enough from the NH3 band yet still close enough to take up nitrogen when the time comes. If a grower plants off the band 4-6 inches, planting can safely take place the day of NH3 application. If a grower is not equipped with GPS, applying NH3 at an angle or planting at an angle relative to an NH3 band is the next best alternative. This insures that at least some of the corn seedlings are far enough away from the NH3 band instead of all of them being directly over the band. I would still advise a grower wait as long as they can (ideally 1 week or better) after the NH3 application before doing this. Make sure NH3 application is occurring at the proper depth. In heavier type soils (CEC 12-15 and greater) it might still be possible to plant over a spring applied NH3 knife track but depth of the NH3 application will be highly important. Applying at depths of 6-8 inches is a good rule to live by. The lighter the soil the closer to 8 inches you need to be. When NH3 is applied it typically stays in a concentrated area 2-6 inches in diameter from the point of injection. The drier the conditions and the lighter the soil the further the ammonia will move from the point of injection. In higher soil moisture conditions, particularly in heavier clay type soils, NH3 stays more concentrated to the point of injection. Therefore, an inch of rain after application usually helps mitigate the risk of injury. This concentrated band makes uniformity of depth during application extremely important. An application too shallow (4 inches) can put the seed within 2 inches of the NH3 band and if the concentration zone expands, there is a strong likelihood the seed is in contact with free ammonia. Keep in mind that when application is done in wetter conditions, staying at a deeper depth could be challenging due to how hard the toolbar might pull. Also making sure the bar is running level and all cylinders are set properly is key to applying at a uniform depth. In fields with a lot of hills and rough terrain, applying at a uniform depth could also be a problem and needs to be taken into consideration at planting. Make sure the knife track is closed properly. It will be important to monitor that proper sealing is taking place when NH3 is being applied. With above average soil moisture being the norm across most of the corn belt, smearing of the sidewall can easily lead to failure of closing the knife track. This can lead to NH3 diffusing up into the seed zone and even worse all the way out of the ground into the atmosphere. Checking for proper closing can be as simple as looking for gas over the knife track or getting a strong whiff ammonia as you work through the field. Summary. My advice to growers this spring is to plant off the knife track or apply at an angle if NH3 is going to be applied within 2 weeks of planting. The heavier the soil (CEC >12-15) and the greater the moisture content, it’s possible to apply over the NH3 band if 1 week has passed and a uniform depth of greater than 6 inches is achieved. Also be very vigilant of proper sealing over the NH3 knife track. 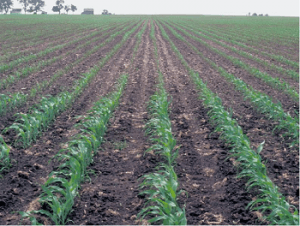 Shallow tillage could be done immediately after application baring the NH3 was applied at the proper depth and conditions are not too dry to allow NH3 to escape the surface. Keep in mind that there are other forms of N out there, such as UAN or Urea, that could be used as a replacement for NH3.